Tell students that this is the fourth activity of their competition. The group who gets a bingo first earns 5 competition points. Instruct the students to sit with their Brain Power! Challenge groups; however, explain to them that, for this activity, they will participate individually and each play their own card. Only one person in the group is required to get a bingo for the team to earn the 5 points. Pass out a bingo card to each student. Using the word bank at the bottom of the card, instruct students to write a word in each of the spaces on the card. Each word should only be used once. Using the teacher bingo sheet, read each definition in order always announcing the number first because this is how the students will mark their cards. For example: Number 1—The active chemical in marijuana. At this time, instruct students to find the answer on their cards and mark with a “1.” Continue reading the definitions in order, reminding students to mark the answer with the definition’s number, until someone yells, “Bingo”. Inform the students that they need to get 5 in a row—diagonally, across, or up and down. Other bingo patterns can be substituted if you choose to do so. Use the teacher bingo sheet to check for correct answers. Marked words should correspond with definition numbers. If the player gets all answers correct, that team earns 5 points. If any of the answers are wrong, the game continues until someone wins. Record the team points on the Group Scorecard. In the 1960s, some people thought that marijuana was a “safe” drug. However, new research presents a different picture of this drug. 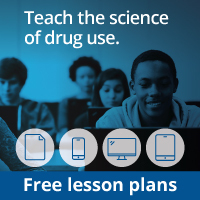 During this activity, students have an opportunity to find out for themselves the latest research on the effects of marijuana on the body and brain. Study current research about marijuana. Create a scientific poster presenting findings from the research. The poster should include statistics about marijuana use, results of recent research, charts and graphs providing important information, and any other relevant findings. Have each group present its findings to the class. After all groups have presented, brainstorm as a class different ways of educating the general public about the latest marijuana research.